Pupils and teachers heading back Bridge Farm Primary School in Whitchurch, Bristol after half term yesterday were stunned to find an original Banksy mural painted in the playground. 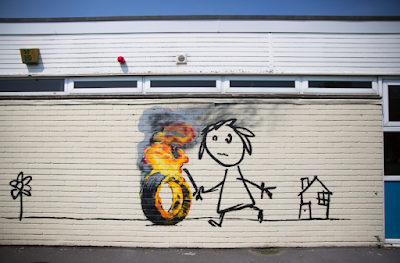 The secretive graffiti artist had left a spray-painting of a child holding a stick and chasing a burning tyre on the wall – the image is believed to be a modern take on hoop rolling, a popular game played by children during the Victorian days. The six-foot high artwork also features a flower and a small house with ‘Banksy’ signed to the bottom left of the brick building. A further note from the artist, pinned behind the mural, said: “Dear Bridge Farm School. Thanks for your letter and naming a house after me. Please have a picture. “If you don’t like it feel free to add stuff, I’m sure the teachers won’t mind.